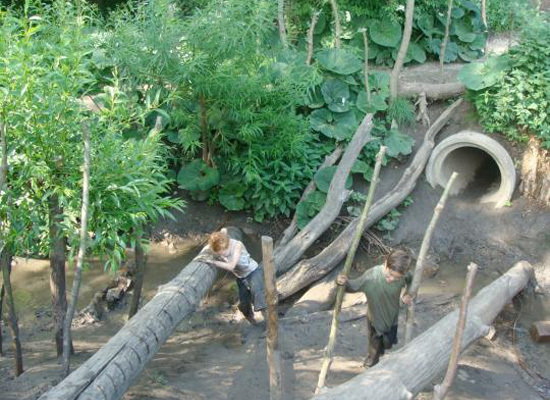 Above is one of six natural playgrounds to be built or already installed in the Netherlands under the fantastically named Mud in Your Pants project. Gone are the plastic fauna, the jungle gyms and their garish paint jobs, the asphalt and the concrete. They've been replaced with real rocks, real plants, real wood pieces, real critters and real soil. Kids will dirty their clothes, scratch their knees, perhaps bruise some bones. These are all good things, as the other option is hours of inactivity in front of the computer or television. A minor infection on a cut or setting the stage for a lifetime of obesity, diabetes and asthma? Like the adventure playgrounds built in the 1970s. sadly, though.. you can't prosecute landowners for building boring playgrounds..
My guess is, very few councils or developers will ever dare to run with this idea in "safety first" climate that exists in many countries of today. I love it! i used to play in a place called "the jungle" which was just like this. Actually, it was just a muddy old creek but we thought it was so adventurous.